^ 1.0 1.1 1.2 1.3 Sherwood, Linda; Willey, Joanne; Woolverton, Christopher. Prescott's Microbiology 9th. New York: McGraw Hill. 2013: 713–721. ISBN 9780073402406. OCLC 886600661. ^ Sender, R; Fuchs, S; Milo, R. Are We Really Vastly Outnumbered? Revisiting the Ratio of Bacterial to Host Cells in Humans. Cell. Jan 2016, 164 (3): 337–40. PMID 26824647. doi:10.1016/j.cell.2016.01.013. ^ Quigley, EM. Gut bacteria in health and disease. Gastroenterol Hepatol (N Y). 2013, 9 (9): 560–9. PMC 3983973. PMID 24729765. ^ Falony G, Vieira-Silva S, Raes J. Microbiology Meets Big Data: The Case of Gut Microbiota-Derived Trimethylamine. Annu. Rev. Microbiol. 2015, 69: 305–321. PMID 26274026. doi:10.1146/annurev-micro-091014-104422. we review literature on trimethylamine (TMA), a microbiota-generated metabolite linked to atherosclerosis development. ^ Gaci N, Borrel G, Tottey W, O'Toole PW, Brugère JF. Archaea and the human gut: new beginning of an old story. World J. Gastroenterol. November 2014, 20 (43): 16062–16078. PMC 4239492. PMID 25473158. doi:10.3748/wjg.v20.i43.16062. Trimethylamine is exclusively a microbiota-derived product of nutrients (lecithin, choline, TMAO, L-carnitine) from normal diet, from which seems originate two diseases, trimethylaminuria (or Fish-Odor Syndrome) and cardiovascular disease through the proatherogenic property of its oxidized liver-derived form. 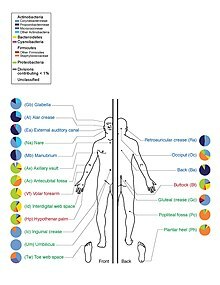 ^ 9.0 9.1 NIH Human Microbiome Project defines normal bacterial makeup of the body. NIH News. 13 June 2012. ^ NIH Human Microbiome Working Group. The NIH Human Microbiome Project. Genome Res. 2009, 19 (12): 2317–2323. PMC 2792171. PMID 19819907. doi:10.1101/gr.096651.109. ^ Human Microbiome Project Consortium. A framework for human microbiome research. Nature. 2012, 486 (7402): 215–221. Bibcode:2012Natur.486..215T. PMC 3377744. PMID 22699610. doi:10.1038/nature11209. ^ The Human Microbiome Project Consortium. Structure, function and diversity of the healthy human microbiome. Nature. 2012, 486 (7402): 207–214. Bibcode:2012Natur.486..207T. PMC 3564958. PMID 22699609. doi:10.1038/nature11234.